While on one hand we are lauding and celebrating PV Sindhu and Sakshi Malik, the two women who’ve brought glory to the country, India isn’t exactly a haven for the average, working woman. 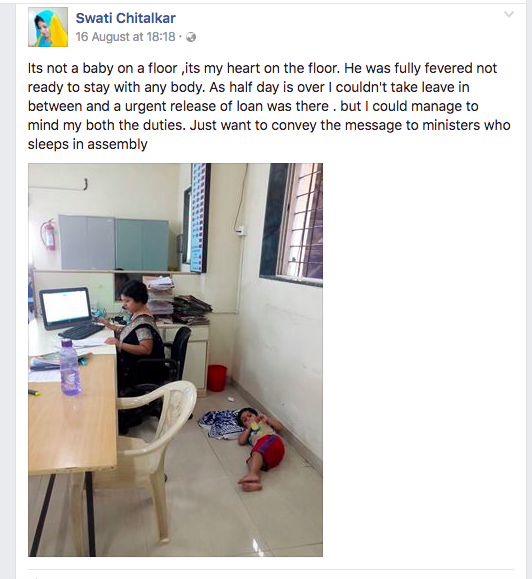 Swati Chitalkar, a bank employee working in Pune shared an image of her young son lying on the floor behind her desk in her office with the following words. It was a simple Facebook share containing 5 lines, but the image and the content evoked strong feelings and in no time it went viral with over 20,000 shares. The message is simple, but the implication is heartbreaking. A working mother with a kid no older than 4 years is forced to be in office and perform her duties even when the child is gravely ill, instead of being back home to take care of him who can be given due rest, comfort, and medical attention in such a time. This post may be a one-off for Swati, but it brings to light the plight of thousands of working mothers in India who continue to work, while trying to juggle their domestic duties and support for their children. Some of the question the post raises are, where was Swati’s husband during this? Could he have taken a leave and taken care of the son. If that’s not a possibility, another major gap it exposes is Swati’s employer’s apathy towards her situation. It reinforces the mentality of government organisations who focus on sticking to policy, inflexible working hours, and allowing no exceptions even for humanitarian reasons. This incident comes close on the heels of the unfortunate incident where a Mumbai-based government employee was denied a half day leave to be with his depressed son, who eventually committed suicide. While private companies are introducing and reinforcing women employee friendly perks such as work from home (in case if ICICI bank and many others), high maternity benefits, menstrual leaves and creches at work, the government institutions in India have a long way to go until they can claim to be women-friendly workplaces.